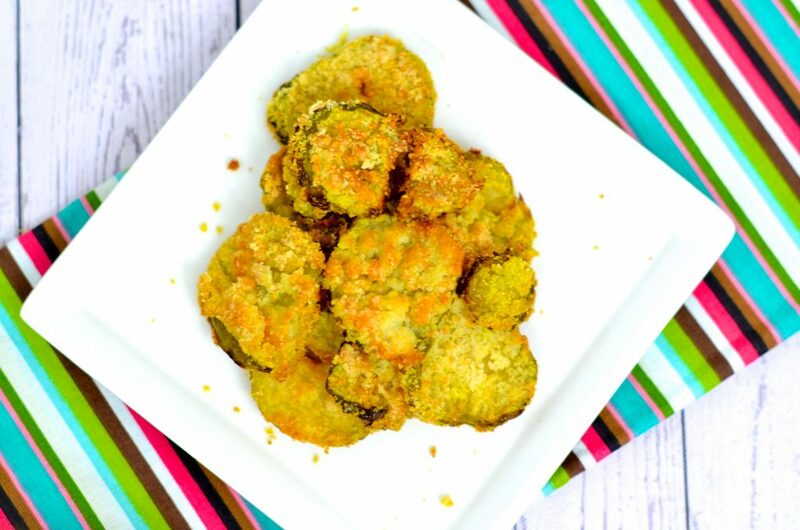 You will not believe the CRUNCH these fried dill pickles get in the air fryer. 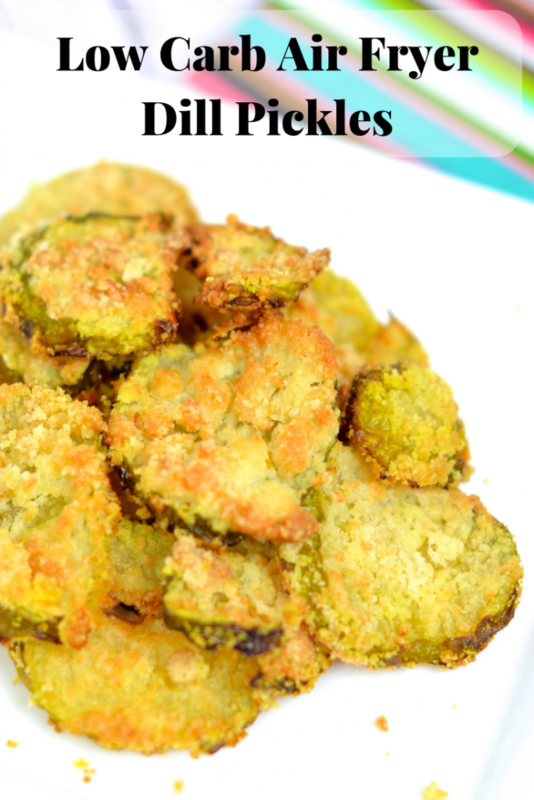 With only 5 ingredients, this dish is so amazingly easy and deliciously low carb. Question Time: Do you love pickles? Pickles. So crunchy, so juicy, so low calorie. My love for pickles more than likely began when I was in diapers. I can distinctly remember opening up the refrigerator door and reaching in the HUGE jar with my hands (I know, pretty nasty right?) and grabbing a big ol’ pickle. Anytime my family visited a fair or went to a football game, my choice of snack at the concession stand was the ultimate, juicy pickle. My love of pickles never left me. Mr Skinny Louisiana thinks they are ‘ok,’ and on every road trip I take to visit my fabulous Houma family (I live in Shreveport now – about a 5 hour drive), my first snack at any gas station is a Big Papa Pickle. Mr Skinny Louisiana got slick. Pretty soon my stocking stuffers from Santa had a Big Papa Pickle, and I am almost certain I will be getting a big industrial size box of pickles for my anniversary. It’s ok, I will enjoy. My love for pickles was tested by my son Christian on a ride down to Houma. He heard me crunching down on a Big Papa Pickle and asked ‘Is that a pickle?’ I thought long and hard about my answer. To lie or to tell the truth. ’Yes’ I said. ‘Can I have it?’ Honestly, I did NOT want to share, so I took a HUGE bite and past the legacy of loving pickles down to him. Now when stopping at the gas station, we purchase 2 pickles. My love for pickles continues with the amazing fried pickles. The crunch, the deliciousness, the carbs, the sodium, and the fat. 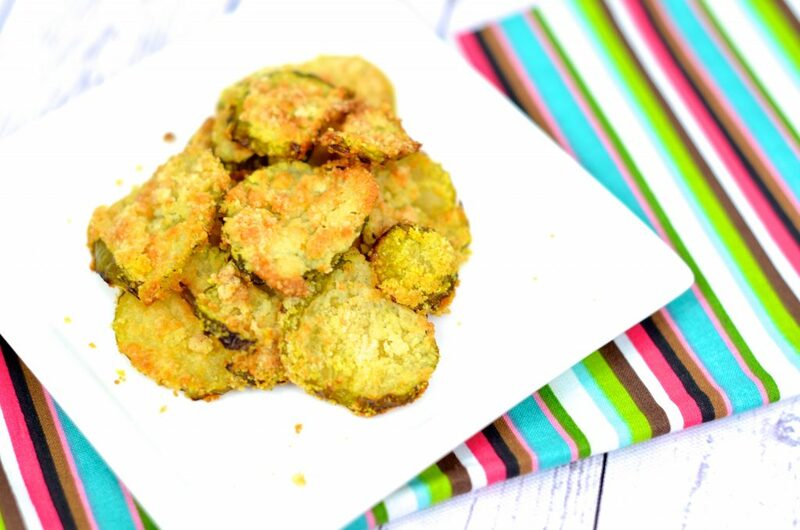 It’s time to take fried pickles to the Skinny Louisiana drawing board. 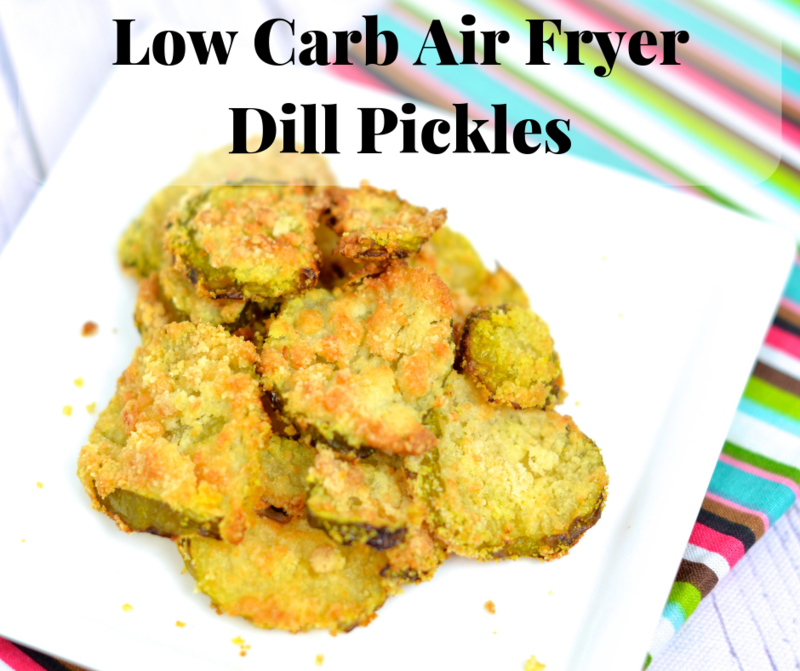 With a few simple ingredient swaps and use of the Air Fryer, we have Air Fryer Fried Dill Pickles the entire family will LOVE. Let me know your thoughts? Want more Air Fryer recipes? Try my Low Carb Air Fryer Beignets! We love pickles, but I am always mindful of sodium. For this recipe, I used the Vlassic low sodium pickles. You will need a knife, cutting board, liquid measuring cups, dry measuring cups, 2 small bowls, tongs, a spoon, and your air fryer. Slice pickles into ‘coins.’ Place to the side. Pour egg white mixture into bowl. In your second bowl, combine almond flour, Parmesan cheese, and Tony Chachere’s. Spray air fryer with non-stick cooking spray. Get the assembly line READY. Dip pickles first in egg whites, then in flour mixture, and line in air fryer. Spray with non stick cooking spray. Cook at 360 for 5 minutes. Open. Using tongs, flip. Cook an additional 5 minutes (you can do more if you want the pickles to be super crispy. WARNING! You may need to repeat! Spray Air Fryer with non stick cooking spray. Pour egg whites in a bowl. In a separate shallow bowl, combine almond flour, Parmesan cheese, and Tony Chachere’s No Salt Seasoning. 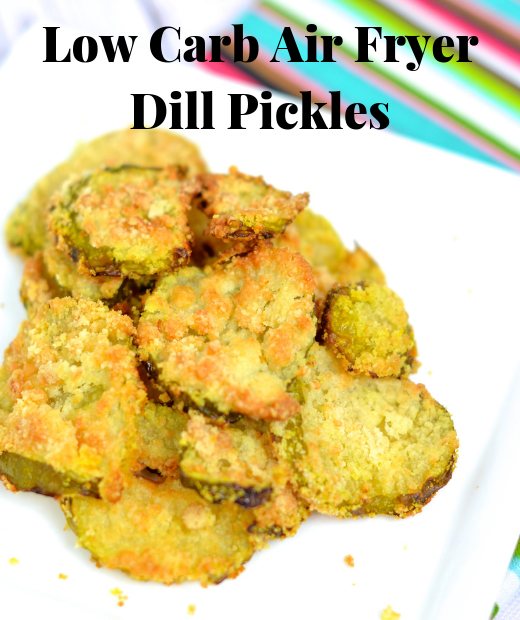 Dip sliced pickles in egg whites, almond flour mixture, and line in Air Fryer. Repeat until Air Fryer basket is filled. Spray with non stick cooking spray. Cook at 360 degrees for 5 minutes. Open basket. Flip. Cook for an additional 5-7 minutes. *You may have to repeat the entire process to cook pickles!!! Before reviewing the nutrition facts per serving, please note we did not use all the almond flour mixture and egg white in preparing our dish. Nutrition facts was determined by using the entire amounts. Good news, the calories, carbs, and sodium are more than likely lower than what is reported. Nutrition Facts per Serving: Calories: 110, Fat: 7g, Saturated fat: 1.5g, Cholesterol: <5mg, Sodium: 135mg, Carbs: 5g, Fiber: 2g, Sugar: 1g, Protein: 8g.